Christie said officials at the U.S. Department of Education could have easily either called New Jersey or found the information on the internet. State Education Commissioner Bret Schundler gave the correct information to the U.S. Department of Education when giving his presentation two weeks ago, Christie said. 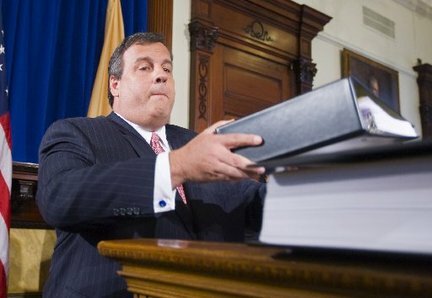 Christie said the mistake was made by a mid-level official at the state Department of Education, and that he would not name him because he did not want to scapegoat anyone. Christie said that, while there is no appeal process in the "Race to the Top" program, there is $100 million in left over funds that were not awarded. He said state Education Commissioner Bret Schundler will write a letter to U.S. Education Secretary Arne Duncan asking if New Jersey could have access to them. "There’s nothing in the process that allows for that, but there’s no harm in asking," he said. This guy isn't serious is he? If I make a mistake on my law school application and the school doesn't grant me admission because of the error, I can't blame the school. It's a competition between the states for the funding. They pick the 10 states who deserve it and a state who can't even get the application right might not be the one who is going to make best use of the funds. Just Sayin. And one more thing, enough with the complaining about the number of pages things are. A grant application for 400 HUNDRED MILLION DOLLARS should be more than just your name and address on a one sided sheet of paper.